Choosing an estate sale company (liquidator) is a decision to be made with careful consideration and knowledge. Please use the following information as a guide to help you choose the best company for your situation. A printable version is also available to assist you during the interview process. This detailed side by side Comparison Checklist will enable you to ask specific questions about crucial elements and help to determine the best company for you. With the exception of receiving a direct referral to a reputable company from your attorney, Realtor, or other professional. Look over the complete list of companies in your area. Call or email as many as possible for information about the services they offer and set up appointments for Complimentary In Home Consultations. A reputable company will need to see your estate to answer this question. Don't let the percentage charged be the only criteria when choosing a company. A lower percentage does not necessarily mean you will make more money. The old adage "You get what you pay for" is often very true. A company with a higher percentage rate may be offering many more services, take additional time and resources to research, market and prepare your sale and there for will ultimately make you more money than a company that charges a lower percentage and does not put in the extra time and effort. The commission percentage is not as important as hiring a reputable company that will work on your behalf to achieve the maximum value for your contents and make the process as stress free for you as possible. A company that charges a flat commission without seeing the contents and taking these points into consideration may have alliterative motives, such as using your sale to provide inventory for their store front or focus more on the quantity of sales they conduct vs. ensuring they conduct quality sales. In addition, a reputable company should not charge any up front fees, and will absorb the cost of all advertising, marketing, supplies and staffing. With the exception of extraordinary clean up charges, there should never been any costs out of pocket to you. Many companies use Licensed & Insured to portray legitimacy as a business, these terms make people feel good. The reality is currently, there is no accrediting body that oversees and regulates the estate sale industry. There are simply good estate sale companies and bad ones. When a company states they are Licensed, this is a mere Business License issued by the County or City giving the company permission to conduct business in that region. If a company states that they are insured, please keep in mind that this protects them from liability, not you. The most important insurance you should be concerned with is a current property and casualty policy on the property, this protects the property and contents and in turn protects you. Once you have narrowed it down to a few companies make an appointment for a Complimentary In Home Consultation. They will want to see what you want liquidated. Use the checklist to assist you in asking specific questions during the in person interview. Do not throw anything away before meeting with the companies. Every company will tell you this and there is a reason. That "pile of junk" or "that trash" might be worth big money. Seriously...don't throw anything away until you have an expert look at it. A reputable company will sort the trash from the treasure as part of the set up and preparation for the sale. Realize the commission, planning and preparation is determined based on the quantity and quality of the items being sold. To avoid confusion it is helpful if you have marked items you will be keeping or made a list of these items prior to your appointment. 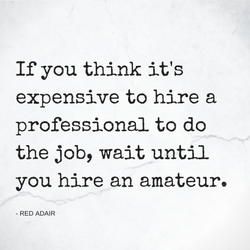 Make sure you know as much as you can about the company prior to hiring them. Google the name of the company with the word “reviews”. See what other people have said about the company. No reviews are better than bad reviews, happy people rarely take the time to comment. The best way to get a feel for a company is to watch them in action. Go to a sale and don't let them know you are there. Look and see how it is set up. How is the presentation? How are customers handled? Do you feel comfortable in the environment they have created? Look for what is important to you. Ask the company for references with contact information for recent clients (not friends & family). Contact those clients and find out what their experience was like. A contract is extremely important. It should detail when the sale will be held, how much the company is charging, when you will get paid, etc. Do not hire a company without a contract. Do NOT sign a contract that transfers ownership of the contents to the company. You should both have a copy of the contract after signing it. A good contract should details what is expected of each party. Use the comprehensive ﻿Comparison Checklist﻿ of specific questions to ask each company the exact same questions. That way you are comparing apples to apples. Please let us know what day works best with your schedule. Please let us know what time of day works best with your schedule, we are flexible.